As you may recall, Ebbsfleet United are currently in the process of auctioning off a replica shirt in the name of charity after it became the subject of a recent viral frenzy. The National League side made headlines when it was noticed that central defender Yado Mambo hadn’t been bequeathed with the squad number his surname so richly warranted: the No.5 shirt. 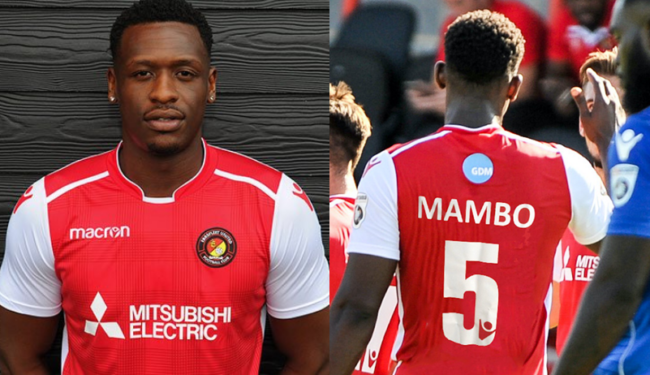 After finally bowing to public pressure, Ebbsfleet proudly announced that they had produced a special one-off ‘Mambo No.5’ jersey and promptly slapped it on Ebay, adding that all proceeds from the sale would be donated to Prostate Cancer UK. Having kicked off at £350 just a few days ago, bidding is currently up around the £1,650 mark. Since the original listing, Lou Bega – the artist who scored an international smash hit with Mambo No.5 – has also agreed to sign the winning shirt! What a coup! Now they just need to secure the signatures of Angela, Pamela, Monica, Erica, Rita, Tina, Sandra, Mary and Jessica to seal the deal. @Beano: Alive, well and German – if you can believe such a thing!